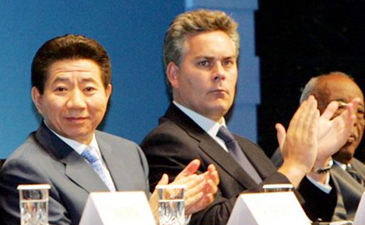 WAN Acting President Gavin O'Reilly (center) and South Korean President Roh Moo-Hyun (left) participate in the 58th World Newspaper Congress held at COEX in Seoul May 30, 2005 . Chief of world's largest organization of newspapers censured South Korean President Roh Moo-Hyun's move to restrict the influence of South Korea's Big Three mass circulation dailies, arguing that South Korea's press situation is not perfect. 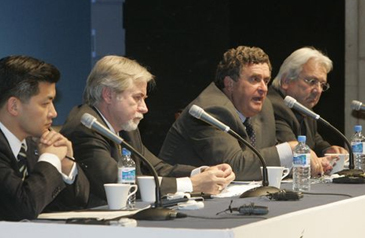 In an opening address of the 58th World Newspaper Congress kicked off May 30, 2005 in Seoul, Acting President Gavin O'Reilly of World Association of Newspapers (WAN) said that South Korean government recently made a press law to restrain the influence of the major newspapers. WAN chief called the Seoul government's step "unwarranted influence" while mentioning the overall press situation of South Korea. 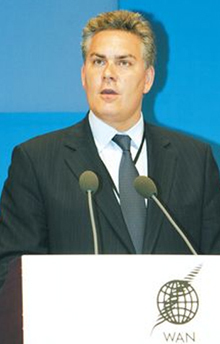 Acting President Gavin O'Reilly of World Association of Newspapers (WAN) delivers a speech at the 58th World Newspaper Congress in Seoul May 30, 2005. He showed deep worries about the South Korea's new press law. O'Reilly raised his voice when he said that he felt that way while President Roh was making welcoming address. President Roh, who delivered the welcoming address prior to O'Reilly, already left the meeting when O'Reilly opened his criticism against Roh. In the speech President Roh emphasized the importance of a system to control the abuse of press power by saying "certain newspapers with a special interest or a certain ideology should not dominate the press market." WAN Acrting President O'Reilly stressed that such attempt to lessen the influence of certain newspapers is unseen in any advanced country. "We have to protect the freedom of the press," he said. O'Reilly's remarks were immediately met with loud accolades from over a thousand participants. He closed his speech by saying "South Korean government should keep this in mind," which touched off another round of big hand from the audience. Around 1,400 journalists from some 80 nations are currently in Seoul to attend the annual press meetings — The 58th World Newspaper Congress and the 12th World Editors Forum — held at the COEX Convention & Exhibition Center in southern Seoul for a four-day run. High-profile attendees included Michael Golden, publisher of International Herald Tribune; Arthur O. Sulzberger, chairman of The New York Times Company; Per Mikael Jensen, vice president and editor-in-chief of Metro International; Michael Grabner, vice chairman of German Holzbrinck's; Shinichi Hakoshima, president of Asahi Shimbun. South Korean President Roh Moo-Hyun is making a welcoming address at the 58th World Newspaper Congress held in Seoul May 30, 2005. 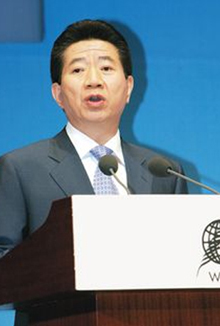 He espressed the need to control the dominance of the Big Three South Korean dailies in his speech. WAN chief O'Reilly's criticism is directed at South Korean government's recent enactment of the press law which will restrict the market shares and influences of Big Three vernacular dailies — Chosun Ilbo, Chungang Ilbo, and Donga Ilbo. The new press law, which goes into effect coming July 28, stipulates that market share of a single newspaper cannot exceed 30 percent and that of over three newspapers cannot account for 60 percent or higher. President Roh and his government defended the new controversial press law as a way of redressing the monopoly of the conservative dailies whereas critics talked about the unconstitutionality of the law. Since his inauguration in Feb. 25, 2003, the reform-minded President Roh and his liberal government have been complaining about "harsh attack" from the "hostile" conservative dailies which dominate South Korean newspaper market with nearly 75 percent of its share. 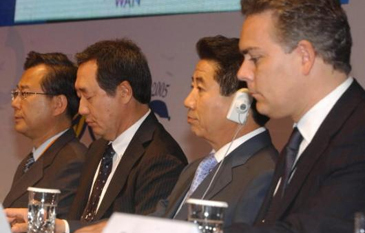 South Korean President Roh Moo-Hyun (second from right) attends the 58th World Newspaper Congress held May 30, 2005 at COEX in Seoul, along with WAN Acting President Gavin O'Reilly (right), President Chang Dae-Hwan (second from left) of Korean Association of Newspapers, and South Korea's Culture Minister Chung Dong-Chae (left). Each of the hugely influential dailies, all very or ultra conservative in its perspective, pour out well over 2 million copies per day. Critics described the tense relations between Roh and the dailies as "a war declared." Driven all the way to the wall by the "attack" of Big Three dailies and ultra-conservative main opposition Grand National Party (GNP), President Roh was even impeached by GNP lawmakers March 12, 2004, barely one year of the start of his presidency. He resumed his presidency months later when South Korea's Constitutional Court ruled the impeachment unconstitutional.